By the time she was a senior, however, she abandoned the mission. “I began to understand that the world is emergent rather than deterministic,” she says. Now, instead of modeling the universe, she wants to understand it better. There’s a lot to tackle, too, like the environment, the people in their environment and their perspectives –things a molecule can’t explain. Through understanding, Lacity educates others about the delivery of technology, such as through global sourcing and automation using robotic process automation, cognitive automation and blockchains. Lacity has done this by studying outsourced call centers in India. Her research has also taken her to an American Indian reservation and a prison where inmates digitized historical patents. This qualitative approach to her research helps her better understand how companies, employees and their customers can utilize technology that benefits everyone. In July, Lacity was named director of the newly created Blockchain Center of Excellence at the Walton College. There, she hopes to educate and challenge students and future leaders about this emerging and innovative process that uses a crowd of independent computers to secure a permanent record of transactions. This method allows participants to verify and audit transactions inexpensively, eliminating the need for an intermediary. This form of information technology, still in its infancy, is already impacting financial models and supply chains. Though cryptocurrencies, such as bitcoin, use this technology, Lacity says she’s looking how companies and startups can benefit from it. Five corporations – IBM, Walmart, Tyson Foods, J.B. Hunt and ArcBest Technologies – are founding members of the Blockchain Center of Excellence. With the assistance of Startup Junkie, a Fayetteville-based consulting service, the center is developing a blockchain network for new businesses, Lacity says. “I knew Dean Waller and the faculty would be great, but the tremendous support from companies and our Governor, Asa Hutchinson, was a welcome surprise,” she says. My family consists of: my partner of 17 years, his 21-year-old daughter, my 19 year-old-son, my parents, three sisters and their husbands, and seven nieces and nephews. My first computer was: They were too expensive to own when I was growing up. … I first used a mainframe computer at Penn State that required us to type instructions on punch cards! If I could live in any period if history, I would choose: now, this life, this moment. When I’m nervous, I: make lists. Writing down what needs to be done helps relieve me of anxiety. My hidden talent is: being appreciative. Every day I take time to realize that I am privileged to be a professor. While the news is filled with all that is wrong with the world, I get to work at a university campus filled with students working to build our future. We’ll all be okay. People might be surprised to learn that I: am a homebody. My idea of fun is: For me, a fun day is a typical day. I like Frederick Nietzsche’s thought experiment about imagining an external recurrence of your life – how would you want to live if you lived your life over and over again? First, I take care of my body. Every day I find time to walk, or go to the gym, enjoy fresh fruits and vegetables and sleep eight hours. Second, I work. I get the most done in the morning … my mind is really sharp for about seven hours. Third, I love being at home with my partner after work. We both disconnect from work and enjoy quiet evenings in the backyard or watching movies or playing cards. My day ends reading a novel and I’m in bed by 9:30. From the outside, my life looks boring, but I feel centered and happy on typical days. As a professor with Department of Information Systems, Lacity is also working with faculty to develop a curriculum for undergraduates, including an interdisciplinary minor, as well as a graduate certification program. Since arriving to Walton, she says she receives steady inquiries from students wanting to learn more about blockchain technology. She encourages them to participate in Walton’s annual Blockchain Hackathon, which is held each fall at the University of Arkansas. There, students form problem-solving teams to learn about the technology and take on business-posed challenges. Lacity comes to Walton from the University of Missouri-St. Louis, where she was Curators’ Distinguished Professor and International Business Fellow. She grew up, however, in Margate City, New Jersey, adjacent to Atlantic City, a popular tourist spot that provided her summer job opportunities. “I grew up with the wrong impression that everyone had a beach nearby,” Lacity says. She earned her bachelor’s degree in quantitative business analytics from Pennsylvania State University and her Ph.D. in information systems from the University of Houston. 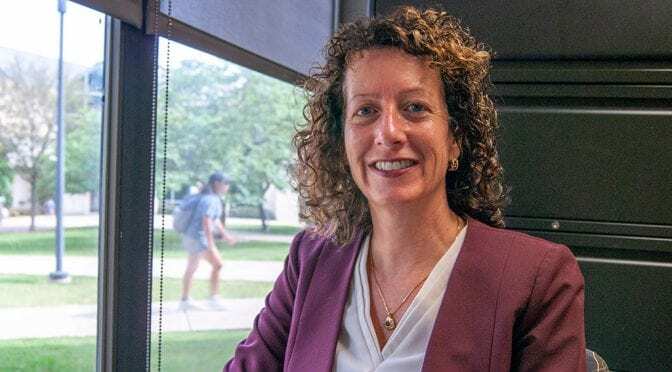 In 1992, she joined faculty at the University of Missouri-St. Louis, where she focused on the outsourcing of technology services, from the creation of contracts to their economic impact and managerial aspects. She later shifted her research to robotic process automation, which utilizes software that performs tasks often deemed tedious, like invoice processing, for example, which can free up workers to focus on more interesting work. Automation takes the robot out of the human – something she and her co-author, Leslie Willcocks, London School of Economics professor, point out. With the emergence of blockchain technology, Lacity continues to educate herself while educating others. It’s a continuing process as it is still in the “proof of concepts” stage and most software has not advanced from its first version, she says. Lacity was a visiting scholar at MIT, where she addressed how enterprises are preparing for blockchain technology, and has held similar positions with the London School of Economics, Washington University and Oxford University. She had been visiting Walton for about four years in various capacities and was very familiar with the college before joining the faculty. She says she worked with Department of Information Systems Chair Rajiv Sabherwal when he was on faculty with the University of Missouri-St. Louis and aspired to work with him again as well as with other distinguished faculty in the department. “This department has an excellent reputation,” she says. She’s also grateful for Department of Information Systems Professor Paul Cronan, who has been a mentor to her. “He’s helping me adjust on a daily basis,” she says. Walton’s Blockchain Center of Excellence is placing Arkansas on centerstage in its curriculum, she says, adding that the mission is to be “platform agnostic” by exposing students to various forms of blockchains. The Department of Finance is also delivering curriculum on cryptocurrencies, she says. The author of 28 books, including A Manager’s Guide to Blockchains for Business: From Knowing What to Knowing How, Lacity’s work has also appeared in many journals. She is senior editor for MIS Quarterly Executive, serving alongside with Varun Grover, distinguished professor and David D. Glass Endowed Chair at Walton. She and Sabherwal will co-edit a special blockchain issue to appear in the journal December 2019. Lacity is embracing Northwest Arkansas and has already visited Crystal Bridges Museum of American Art in Bentonville several times since arriving. “It just uplifts my spirit,” she says.